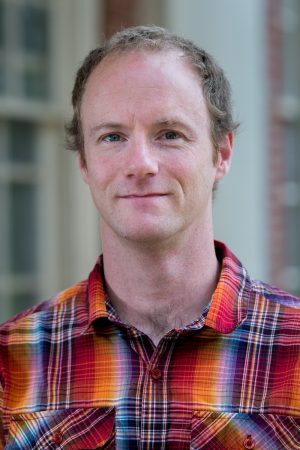 A mathematician who specializes in abstract algebra—and pizza making—is the newest member of Randolph’s mathematics department faculty. In his first semester at Randolph this fall, math professor Michael Penn is teaching Calculus 1 and Linear Algebra and Differential Equations courses. He previously worked as a visiting professor at the University of Tennessee Chattanooga, Bowdoin College, and Colorado College. Penn earned his B.S. degree from the University of Arkansas at Little Rock, his M.A. from Indiana University, and his Ph.D. from the State University of New York at Albany. Along the way he completed and published extensive research on vertex operator algebras, an algebraic version of what physicists study in string theory. Now he is eager to share what he knows and engage with Randolph students in the classroom. Penn moved to Lynchburg with his wife and two children in August, and the entire family enjoys rock climbing and hiking the many nearby trails. One of Penn’s other hobbies is making pizza from scratch. He makes his own dough and recently ordered an outdoor pizza oven that can heat up to 900 degrees and cook an entire pizza in under two minutes.